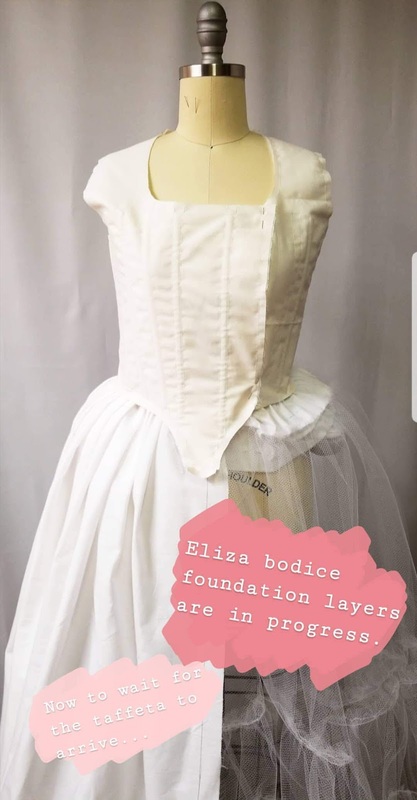 As promised in my last post, today's post is all about the making of Eliza. 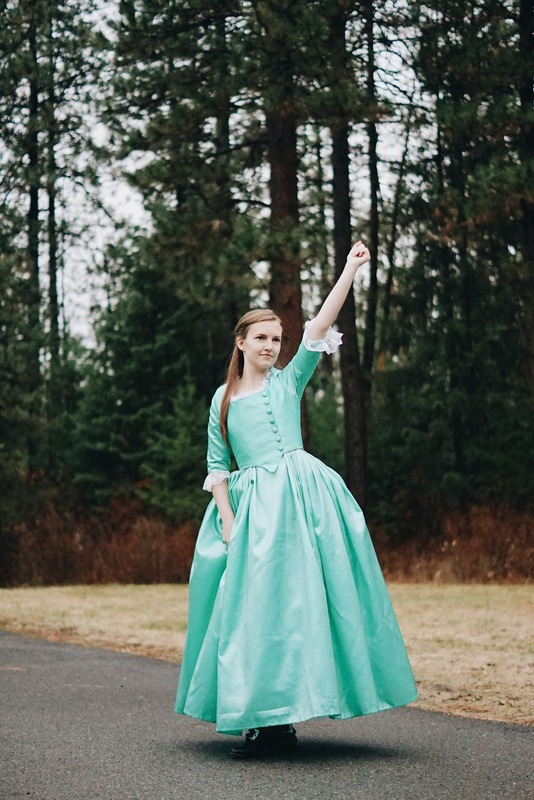 For Halloween this year I decided to go as Eliza Schuyler from Hamilton. This was a really fun costume to make and wear, and it's become my favorite cosplay I've made. During the making process I failed at taking progress pictures like I usually try to do, so this post will have a lot of written information instead of visual. However I did post a fair amount on my Instagram stories. They're featured on my profile if you want to check them out. I'll be using a few of them in today's post to help explain my process. 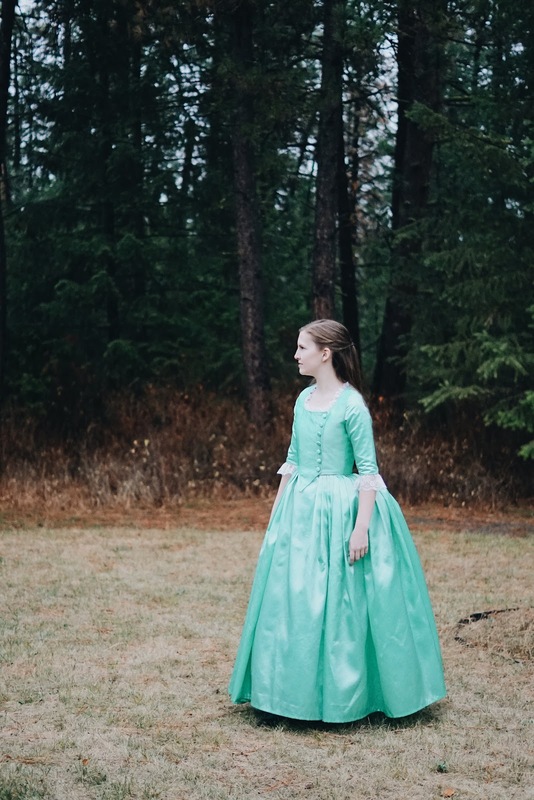 The pattern was self drafted, using a combination of draping and drafting techniques. 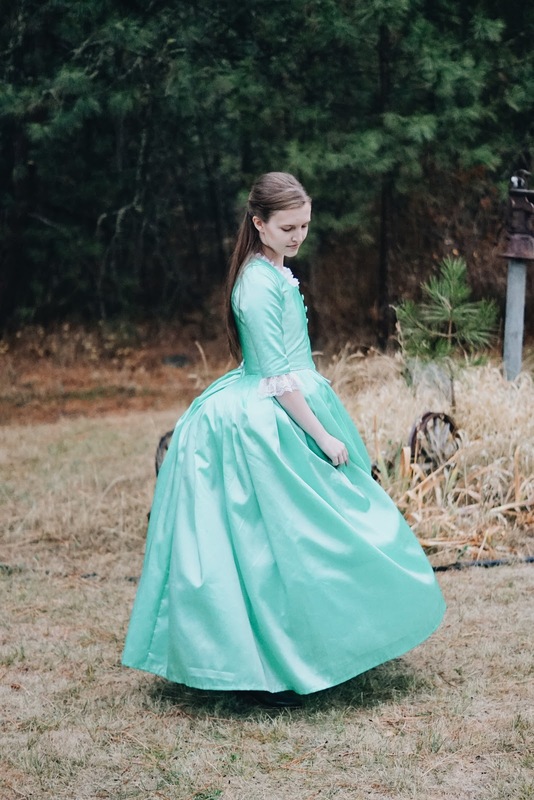 The bodice was fairly easy to figure out since it's a pretty accurate 18th century shape, although the back has princess seams which are definitely a modern cut. But overall it stays pretty true to the 1770's. 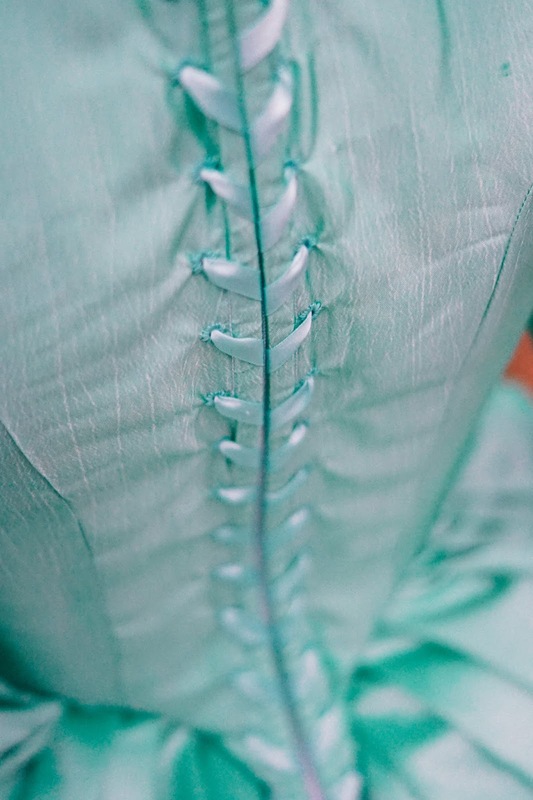 The trick to the bodice was all in the structure. I used a medium weight canvas and muslin for the lining and structure layer. I boned the princess seams and the center back silk layer for the faux lacing (more on that soon), and the front had straight up and down boning. It actually took a lot less boning than I was originally expecting. The only thing I would do differently here is use a heavier weight canvas and move the center front boning a little closer together and further down the point at the front. Otherwise I'm very happy with how smooth the bodice turned out. 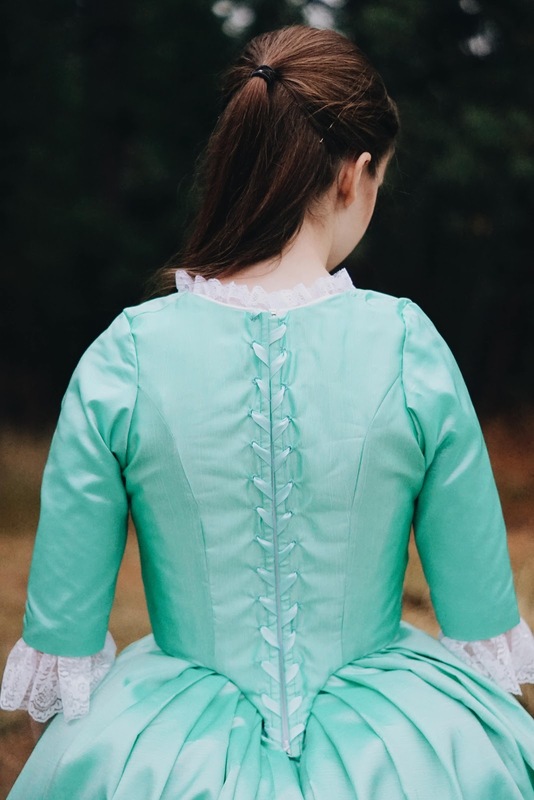 The back of the bodice has a long row of faux lacing. If you look closely at the stage costumes, you'll notice that the back has what appears to be lacing, but underneath is actually a zipper. 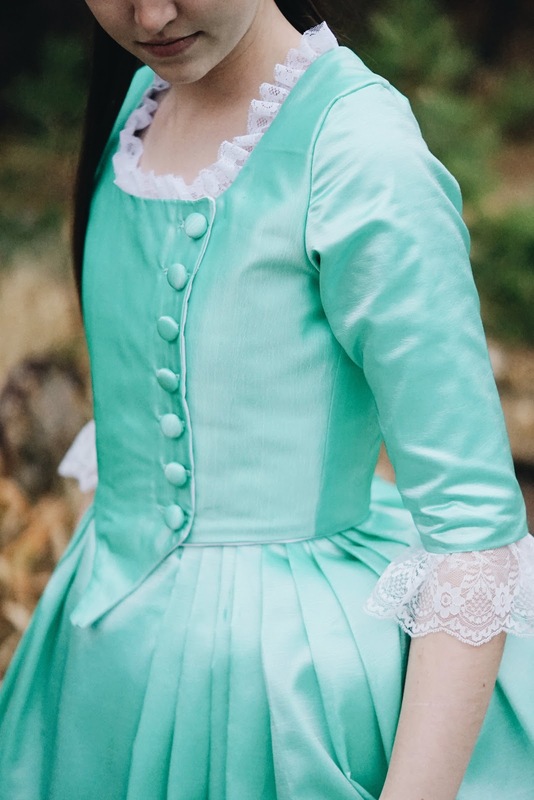 I contemplated just putting a zipper in the back since with my long hair no one would even see the back, but I opted for accuracy and hand sewed almost 30 eyelets. The lining and the top fabric are stitched together everywhere except for the center back, where they're left separate. I folded the edge of the silk under to create a boning channel and put a separating zipper in the lining. The front of the bodice has a row of buttons, again they don't function. I covered the buttons myself with a kit, which was actually really fun! I stitched button holes but didn't cut them open, and I stitched the buttons on top. The neckline has a small lace stitched around the neckline, and there's a wider lace in the sleeves. It's all just basted in, so it's easy to remove if it ever needs to be replaced. The sleeves were another challenge. I wanted to make sure I could move and replicate the famous "work" pose. In my first mockup attempt I made a normal sleeve and could barely bring my arm up level with my chest, let alone straight up. So after a lot of research and a couple of trials, I finally found something that worked. I found a great article, which you can read here, on how to shape a sleeve for maximum movement. It took a few attempts, but eventually I got the pattern figured out and it fit beautifully! The skirt was the most difficult thing to figure out even though it's relatively simple. When I started planning I had no idea how much fabric I would need. 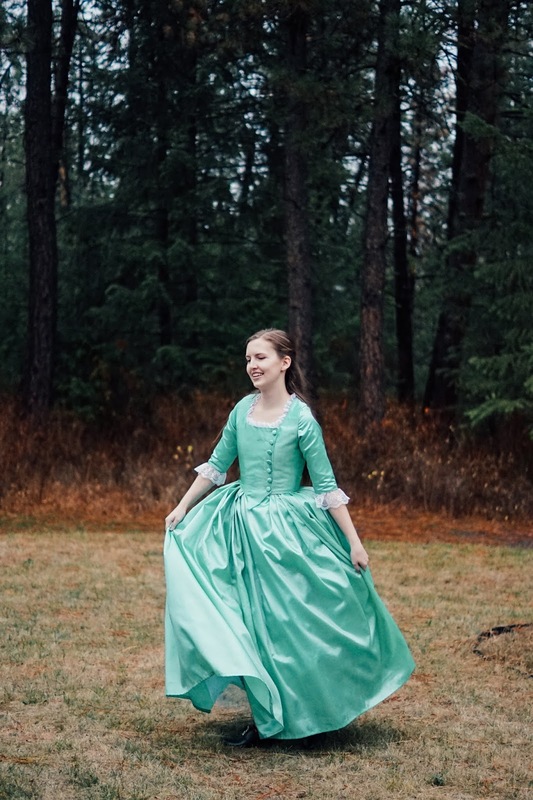 The 18th century skirts I've made in the past only used a few yards of material, but it was clear that there was a lot more fabric in the stage skirts when they twirl. After asking around on some Facebook groups, I realized that the minimum circumference I would need is 5 yards. And after making this, I would use 8-10 yards if I ever remake this dress. The trick in getting the right look is all in the pleating. I'll do my best to explain, but it's one of those things that's hard to tell instead of show. The pleats have to really small but have a lot of overlap (or underlap?) You only want to see maybe 1/2 an inch, but the pleat should be 2-3 inches deep. But you want to make the first few, in the front, more shallow, to keep the front flat. Again, this is an area I would do differently should I ever make this dress again. I didn't make my pleats small enough or overlap enough (this is where the extra fabric was needed), particularly on the back. I didn't keep the pleats small enough in the front, so there's more material and it lays differently than the original dress. It's a little detail that most people probably don't even notice, but it stands out a lot to me. There was no real shape to the skirt, it was just one big rectangular piece. Because my fabric was 60" wide, I cut the hem down to floor length before I started pleating. 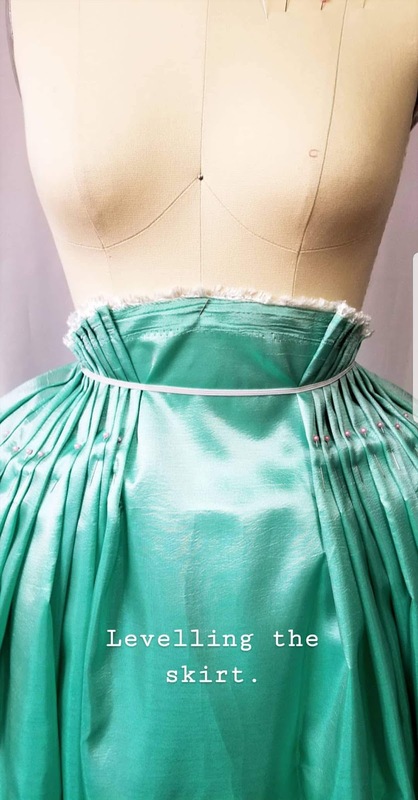 Once I had the pleats pinned over my bum pad and petticoat, I used a skirt leveling technique I learned from the book Period Costume for the Stage and Screen. After that I used a 1 inch hem allowance and hand stitched it. Basically you tie a piece of string (I used elastic. I'm still not sure if that was a good idea or not) about the waist where the waistband will be. Then you raise the skirt, in this case just the front, until the hem is even, and you cut the excess above the string/elastic and voila! You have an even, straight hem. When working with a straight edge for a hem, you never want to trim the bottom. You want to level it from the top and cut that part instead of the hem. I speak from experience. The accessories for this costume were really minimal, and I didn't even get the right colors. XD I already had a pair of black Kensington's from American Duchess, so I wore those. 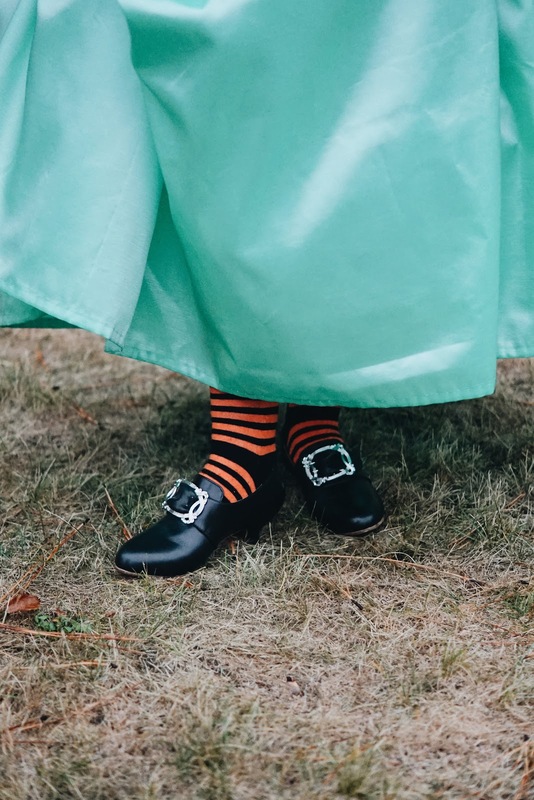 And because it was Halloween, I wore my favorite stockings. I wore these with the last couple of historical Halloween costumes, so it's becoming a tradition.